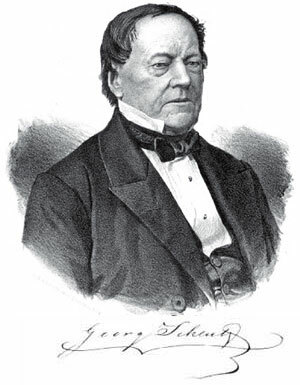 Pehr Georg Scheutz was born in Jönköping, Sweden, on 23 September, 1785. His father, Fredrik Christian Ludvig Schieutz, was born in Copenhagen of German parents. Together with his wife, Johanna Christina Berg, he ran the popular inn and wine merchant's business Fortuna in Jönköping. Besides the inn, Fredrik Schieutz was responsible for providing refreshment for the guests at Medevi Spring, the most frequented spa in the country at that time. It was in this stimulating, cosmopolitan spot at the southern end of Lake Vättern that Georg Scheutz, his parents' only son, grew up. In 1796, when he was eleven years old, Georg Scheutz entered Jönköping elementary school. There he followed the normal course of instruction, which included theology, history and political geography and in addition he made the acquaintance of the classical authors. Afterwards Scheutz moved on to the Gymnasium in Wexiö, where the subjects on the curriculum were much the same as before. He showed a particular interest in languages and read the New Testament in Greek and even picked up somewhat outside the normal routine a fair amount of Hebrew. The main emphasis of Scheutz' schooling was on languages and the humanities and this was to be of great use to him in his future career. Scheutz began his study at the University of Lund in the autumn of 1803, where he obtained his law degree in 1805, in preparation for more senior posts in mining, which had become his main goal. In 1800 his father had died and in order to pay his way, Scheutz had been compelled to tutor junior students. In 1805, he became probationer at Göta Hovrätt in his home town. At various times, he also served as deputy actuary, provisional magistrate and on one occasion as mayor in Ulricehamn. In 1811 Scheutz moved to Stockholm where he was employed in the chancellery of "Justitie-Revisionen för Sjöärendena", the body charged with the preliminary investigation of Supreme Court cases dealing with maritime affairs. Scheutz was appointed second auditor with the Svea Artillery Regiment and in November 1814, he received "Royal authorization as Auditeur". This type of post carried with it more honour than money, which led Scheutz in 1816 to resign. He had given eleven years of his life to the Law and now he left it for ever. Scheutz decided to start a publishing and printing business and in 1817 he selled a printing press and the Stockholm's newspaper Anmärkaren, becoming a printer and journalist. As a editor and columnist of his newspaper, Scheutz became famous as a political journalist. 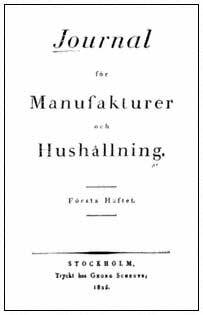 In 1825 he started the first technical journal in Sweden, the monthly Journal för Manufakturer och Hushållning (see the nearby photo). This magazine contained descriptions of useful inventions and discoveries in physics, chemistry and technology, which could be simply put to practical use by the intended readers cottagers and tradesmen. It was in this journal, in November 1833, that the Swedish public were first introduced to Charles Babbage's difference engine. Later on this article will bring Scheutz to the creation of his famous differential engine. In seeking to spread knowledge about science and technology, Scheutz published not only magazines and newspapers, but also quite a number of technical handbooks. This began in 1819 with Handbok för så wäl enklare som mera konstig Blekning, and between then and 1832, he published some twelve handbooks in all, which were collected in a series entitled "Library for Art, Handicrafts and Applied Science". Later on Scheutz continued to publish technical handbooks, translated and edited by himself. The creative side to Scheutz' nature was not content simply to read and write about technical matters. The technical problems he encountered at his press, led him to make improvements and it was there that he was to make his own first inventions. Around the end of 1819, he applied for a twenty-year patent for a number of improvements connected with printing. In 1823 he submitted a new patent application. This time the foot-operated machine was equipped with a cylinder. Scheutz made inventions in other fields as well. Around 1835 Scheutz invented a safety valve for steam engines, which was manufactured and successfully used in at least one factory in Stockholm. Five years later he applied for a ten year patent on "using steam to bring about a rotary motion" in other words, for a simple type of steam turbine. Another of his inventions was an optical instrument used for copying called "Portfeuille Iconografique" for which he sought a patent in 1841. The following year, Scheutz applied for a patent for a drawing instrument which he called ''Sinus-delare" (Sine divider), and in 1850 he applied for a patent for "metod att bränna Tak-och Murtegel" (method of baking tiles and bricks). Scheutz was also one of skillfull Swedish translators from the first half of 19th century. In 1816 appeared, Scheutz's translation into Swedish of Shakespeare's Julius Caesar. It was the first translation into Swedish of this particular work, and only the second of any Shakespearean work. Later on he will translate and publish La Motte-Fouque, Werner, Kotzebue and Boccaccio, classical works of Aristophanes and Xenophon, native literature such as the historic plays of Per Henrik Ling and language readers for learning Latin or Italian. 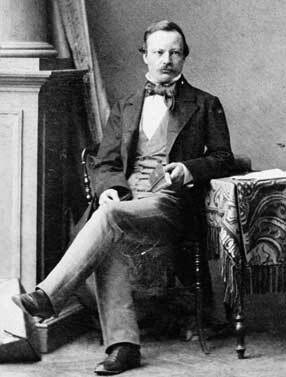 Pehr Georg Scheutz was engaged for Anna Margaretha Schaumann and on 3th of September, 1821, in Stockholm was born their son—Edvard Georg Raphael (see the nearby photo). Anna Schaumann died on 16th of March 1823, from breast fever after having given birth to a daughter. The child lived for only one day. Edvard began his studies at the New Elementary School, but was forced to discontinue on account of a leg injury. In 1835 he entered the Technological Institute, and remained there until 1841. Little is known of Edvard Scheutz's interests outside the field of mechanical technology. It seems clear, however, that he worked closely with his father. He even wrote a comedy published by the Scheutz publishing firm in 1836, when Edvard was only 15! Joining his father's efforts to create a differential engine in 1837, till the end of his life in 1881, Edvard devoted his life on the production, promotion and efforts to sell the machine. Pehr Georg Scheutz died on May 22th, 1873, in Stockholm. In establishing Georg Scheutz's place in the history of computation, we must credit him and his son Edvard not only with the first working differential engine, but with the first complete construction of a printing calculator.